Some of the eggs which are being tested at German labs. 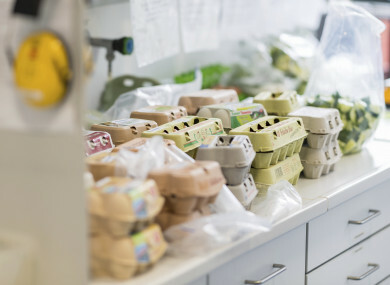 SUPERMARKETS IN THE Netherlands and Germany were removing millions of eggs from their shelves believed to have been contaminated by a toxic insecticide in a widening food scandal. Amid fears the Dutch poultry industry could be facing huge financial losses, German officials said they believed three million tainted eggs had been made their way into the country and been sold. After shuttering 180 businesses earlier in the week, the Dutch food authority (NVWA) said following tests that 138 poultry farms, about a fifth of all such concerns in the country, would remain closed, with one batch of eggs posing “an acute danger to public health”. Eggs from another 59 farms contained high enough levels of the insecticide, fipronil, that the food authority warned they should not be eaten by children. “Those businesses whose egg codes have been printed on the website will remain closed,” the NVWA said, publishing a list of 138 codes printed on the sides of the eggs, which identify which farm they have come from. According to Dutch media, 10 billion eggs were produced in the country last year by about 1,000 poultry farms, with many of them going across the border into Germany. The German agricultural ministry said “at least three million contaminated eggs” had been delivered from the Netherlands to Germany in recent weeks, most of which had been sold. “Germany has been worse affected” than initially thought, admitted German Agriculture Minister Christian Schmidt after holding a “crisis teleconference” with his counterparts in German states. Manufactured by Germany’s BASF among other companies, fipronil is commonly used in veterinary products to get rid of fleas, lice and ticks. The European Commission said it had been made aware of the egg issue, and spokeswoman Anna-Kaisa Itkonen told reporters developments were being monitored “very closely”. It is believed the toxic substance was introduced to poultry farms by a Dutch business, named Chickfriend, brought in to treat red lice, a nasty parasite in chickens. German officials are also investigating reports that the contaminated product had been delivered directly to German poultry farms in the Lower Saxony region, which then sold their eggs in other parts of the country. The biggest supermarket chain in The Netherlands, Albert Heijn, said meanwhile it was pulling 14 types of eggs from its shelves. “All the eggs of these 14 kinds have been sent back to the depot and destroyed,” company spokeswoman Els van Dijk told AFP. Belgium’s federal food chain security agency (AFSCA) has also launched a criminal investigation in cooperation with prosecutors. In large quantities, the insecticide is considered to be “moderately hazardous” according to the World Health Organisation, and can have dangerous effects on people’s kidneys, liver and thyroid glands. Email “Supermarkets scrambling to remove products as millions of European eggs 'could be poisonous'”. Feedback on “Supermarkets scrambling to remove products as millions of European eggs 'could be poisonous'”.